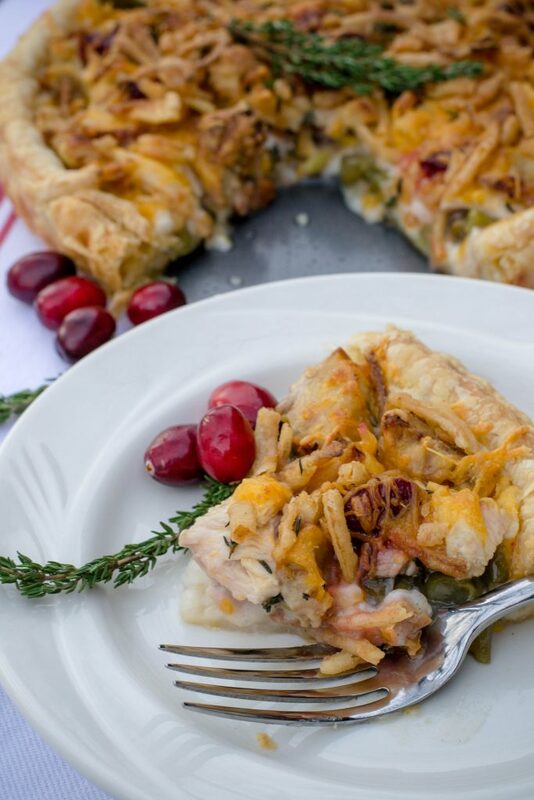 Leftovers Turkey Tart - What the Forks for Dinner? Turkey day is over for another year. Having of course made way to much food, means leftovers. “What” are we going to do with all these leftovers???? Leftovers Turkey Tart. I have made varying recipes over the years with leftover Thanksgiving fare. Grilled Sandwiches, pizza, quesadillas. This year, Leftovers Turkey Tart. 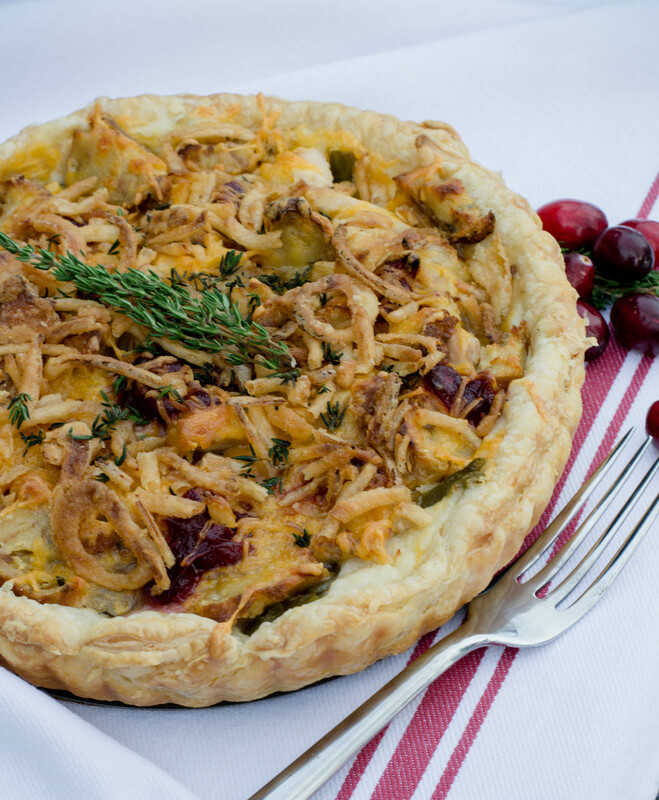 The recipe is a cross between a pie and pizza, but with puff pastry crust..so a tart! I LOVE puff pastry……light, flaky, tender, and oh so buttery. Savory or sweet, it’s the tastiest! The tart filling is the best of your Thanksgiving Day meal. 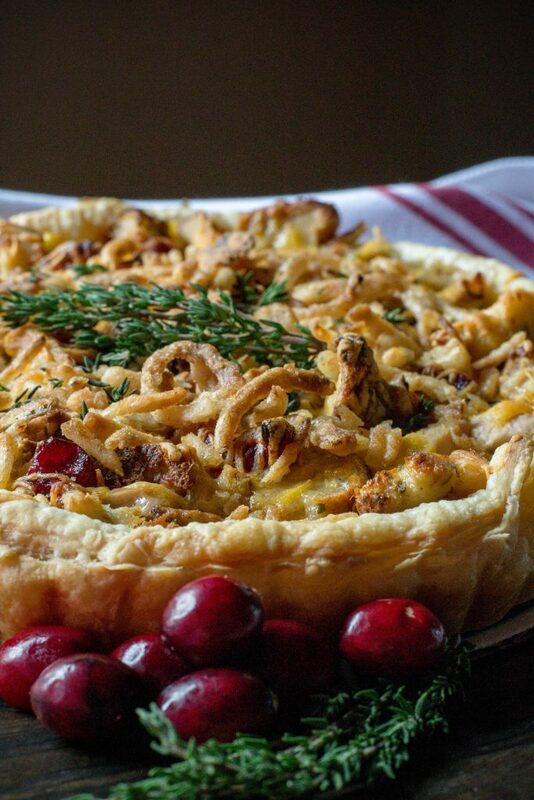 Mashed potatoes, gravy, turkey, stuffing, corn, cranberry sauce, or whatever your traditional meal was can be turned into Leftovers Turkey Tart. The recipe is simple and quick. 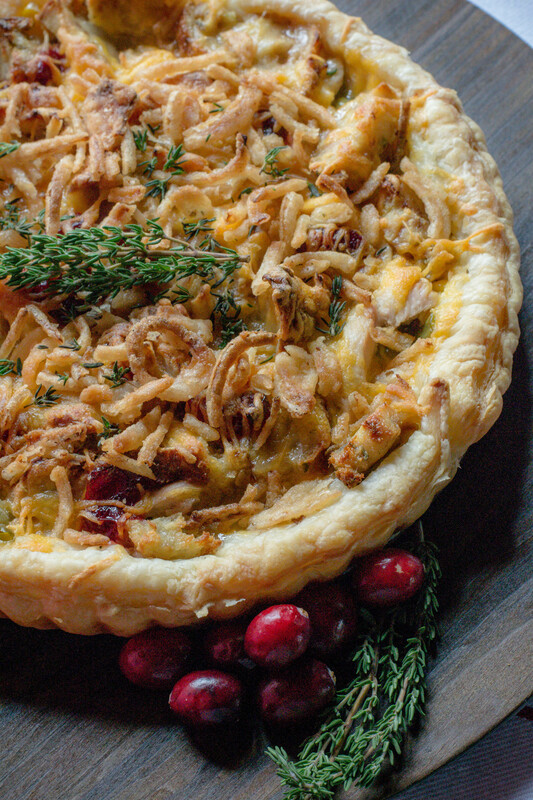 Puff pastry pressed into a tart pan then layers with all of Thanksgiving! A sprinkle of cheese, and into the oven for 20-25 minutes. 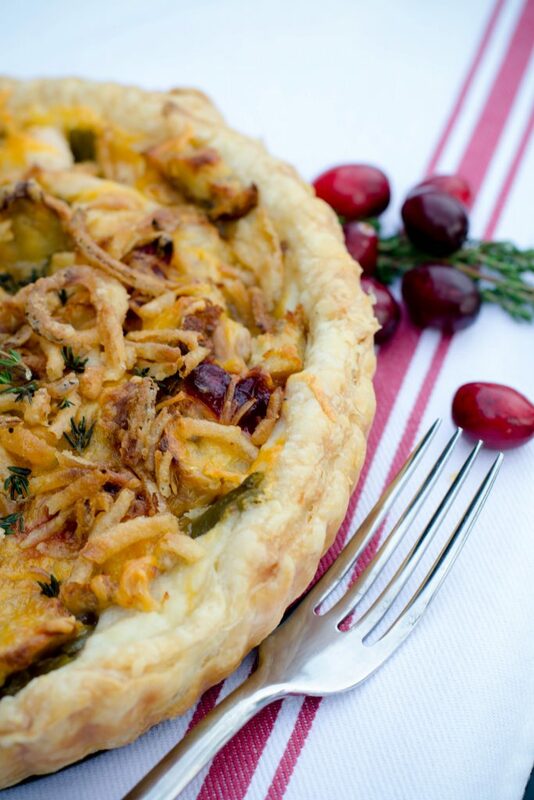 For a quick crunch put French fried onions on top, then back into the oven for a few extra minutes. Remove from the oven and garnish with thyme leave and pepper. Let rest for a few minutes before slicing into wedges. The perfect slice of turkey day, the day after. 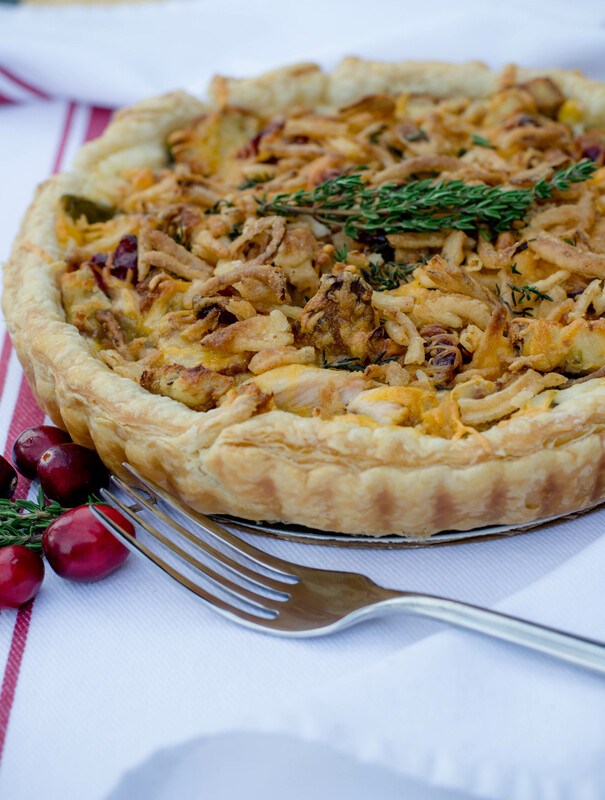 So, use those leftovers for Leftovers Turkey Tart and give thanks…that belts are adjustable and yoga pants are in style!! Gently roll puff pastry to seal the folds and press into a 9-inch tart pan sprayed with non stick cooking spray.Trim the overhang and use to fill in any empty spaces along the sides of the pan. Spread the mashed potatoes over the bottom and drizzle with half of the of gravy. Layer with remaining ingredients and drizzle with the other half of the gravy. Place French fried onions on top of tart and bake for an additional 3-5 minutes. Garnish with thyme and freshly ground black pepper.